Dr. Villarreal is a Professor of Internal Medicine and former Chief for the Division of Cardiology at SUNY Upstate Medical University in Syracuse, New York. He received his medical degree from the National University of Mexico in 1975. He served his residency in Internal Medicine and his Cardiology Fellowship at Barnes-Jewish Hospital, Washington University, St. Louis Missouri. He received additional training in cardiovascular research with Dr. James O. Davis at the University of Missouri - Columbia. In 1984, he became Assistant Professor of Medicine and Physiology at the same institution. In 1990, he was promoted to Associate Professor of Medicine and Physiology and later received the Brent M. Parker Distinguished Professorship in Cardiology. In 1991, Dr. Villarreal became Director of the Coronary Care Unit, and in 1992, he became Chief of the Cardiology Section at the Veterans Administration Medical Center in Columbia, Missouri. From 1996 - 1999, Dr. Villarreal served as Director of the Cardio-Renal Service, Co-Director of the Division of Cardiology and the Program Director for the Cardiology Fellowship Program. In 2000, he became Professor of Medicine and served as Chief of the Division of Cardiology at SUNY Upstate Medical University in Syracuse New York from 2000 to 2013. He is presently Director of the Heart Failure Program and EKG Laboratory at the same institution. Among his multiple honors are the Research Career Developmental Award and the Scissors Award from the VAH, one of the highest honors bestowed by the Department of National Veterans' Affairs. He has been elected as Fellow of the American Heart Association, the American College of Cardiology, American College of Physicians and the International Academy of Cardiovascular Sciences. He has received distinguished awards and medals of merit for excellence in cardiovascular research and education from the International Academy of Medical Sciences, the University of Minas Gerais - Brazil, and the National University of Mexico. Dr. Villarreal's basic and clinical research, which has been funded by NIH, AHA and VAH is primarily concerned with neurohormonal mechanisms in cardio-renal integration, including the role of the renin-angiotensin-aldosterone axis, natriuretic peptides, renal sympathetic nerves, and leptin in homeostasis, as well as in prevalent cardiovascular diseases such as hypertension and heart failure. Dr. Villarreal is a member of several distinguished professional societies. In 1999, he was elected president of the Central Society for Clinical Research, and more recently has served as councilor of the ISHR, and chairman of the 2004 annual meeting of the Society. Dr. Villarreal has been a member of the Southern Society for Clinical Investigation since 2009. He served as its President in 2014 and presently serves as a member of the Executive Advisory Committee, the Website Committee and the Nominating Committee. 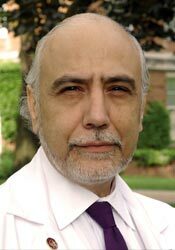 He is also Chair of the Mentoring Committee and also serves as lecturer in the Visiting Professor Program.